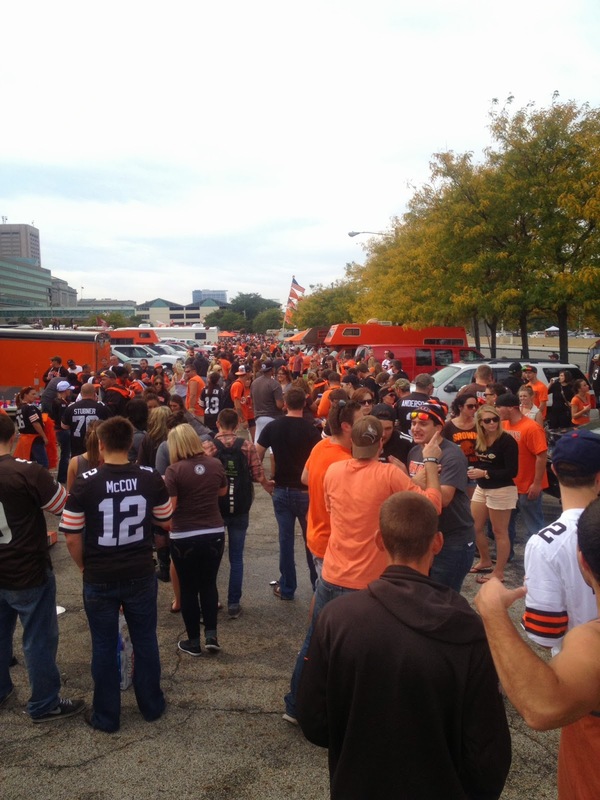 Early season tailgates are the best. The shores of Lake Erie delivered another perfect fall day. Hold the Pigskin hosted another big crowd including the one who penned the name of the blog, Nick Harper. 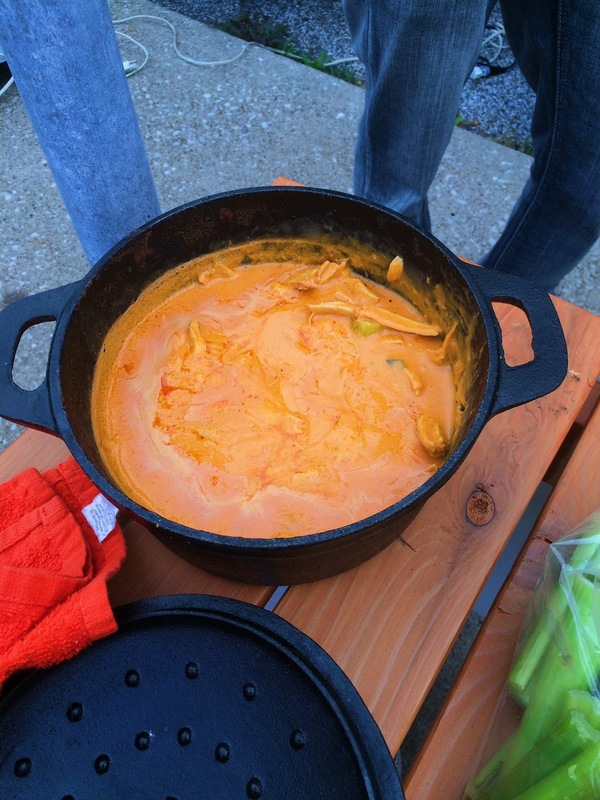 Nick loves him buffalo flavored anything, so I figured it was time to recreate an American classic: buffalo chicken dip. 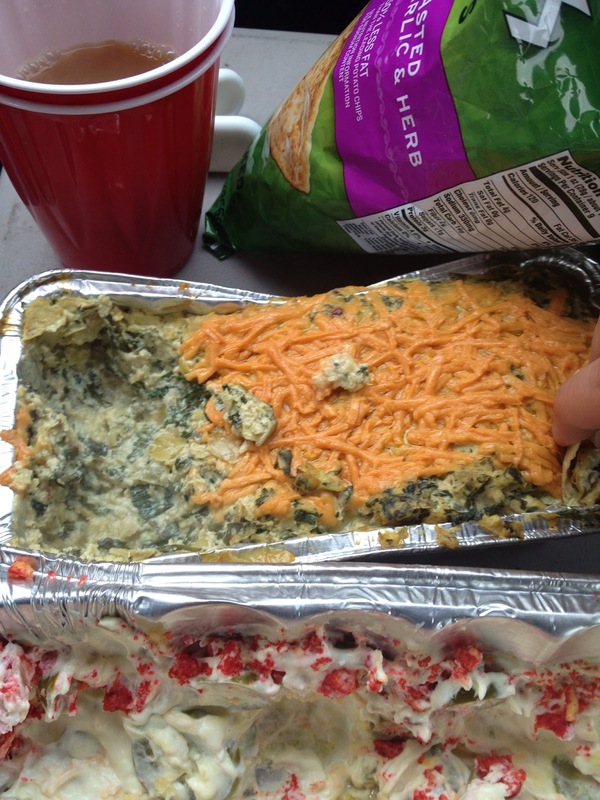 There is nothing healthy about this dip, which is probably why it tastes so good. Vegan cream cheese, sour cream and cheese. 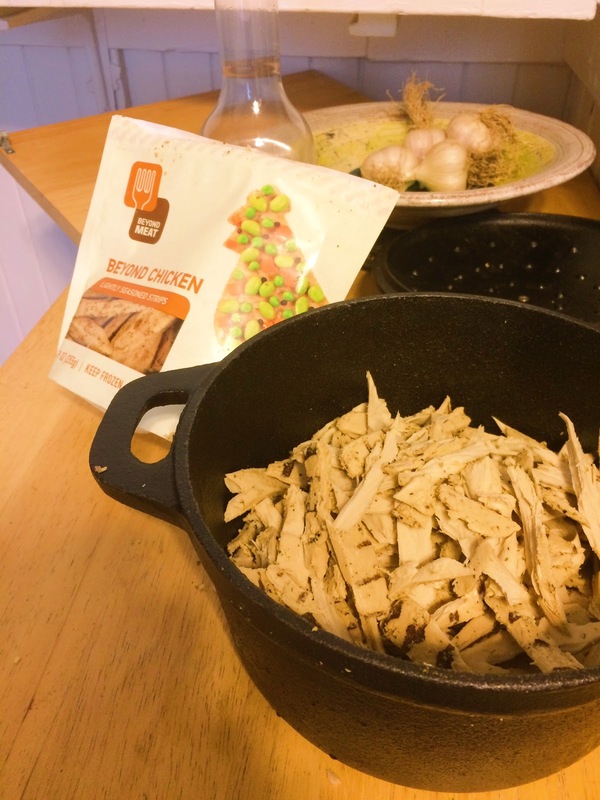 Two packages of shredded Beyond Meat chicken strips. 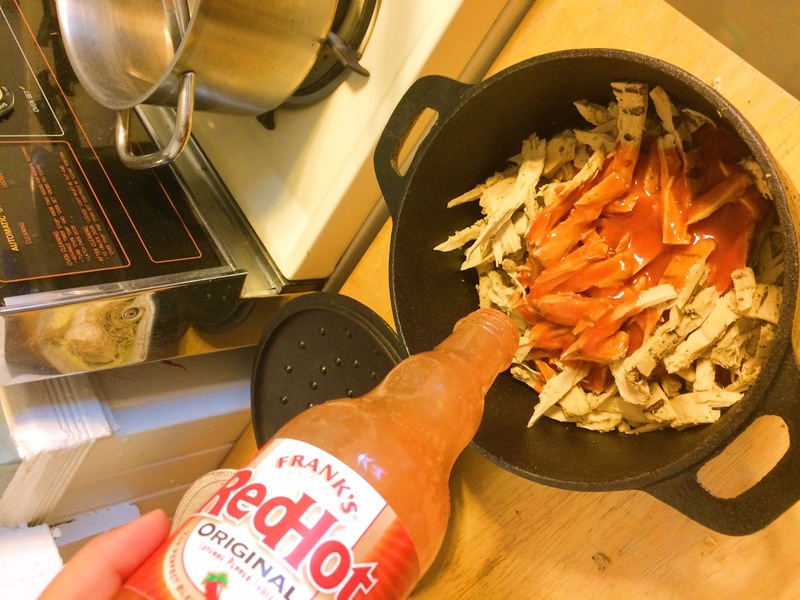 An entire bottle of Frank’s Red Hot. My mouth just starts salivating recapping those ingredients. proclaimed “future of protein,” now has a roster of sports stars endorsing their product. Made with non-gmo soy and pea protein, the chicken also has some great flavor and shreds perfectly. 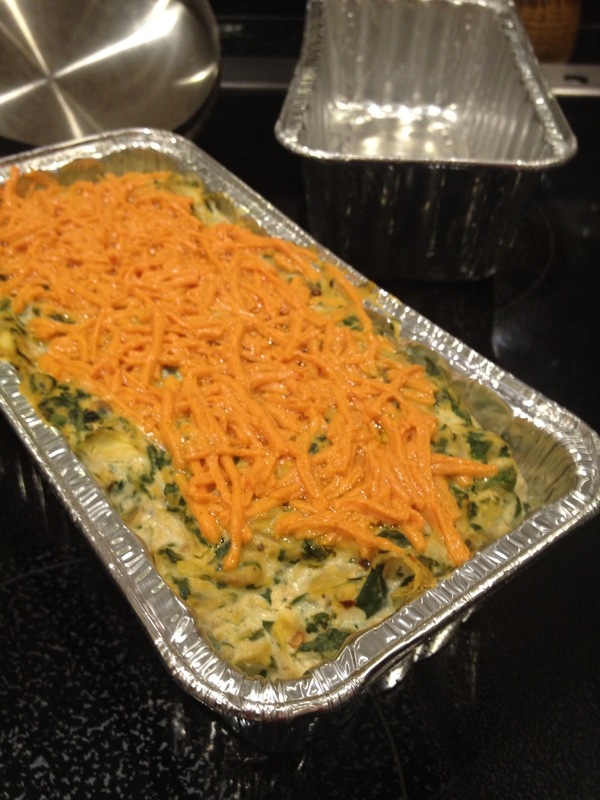 Do not use another brand when making this dish! One final tip before I get into the recipe. Invest in a cast iron pot so you can make this dish on the grill. The unvieling off the grill will draw ooh’s and ah’s from the crowd. Enjoy! Nick was pestering me all week for this recipe. Sorry for the delay! In a cast iron dish, spread out the chicken and pour the wing sauce over. Mix well and spread out, covering the entire bottom of the dish. 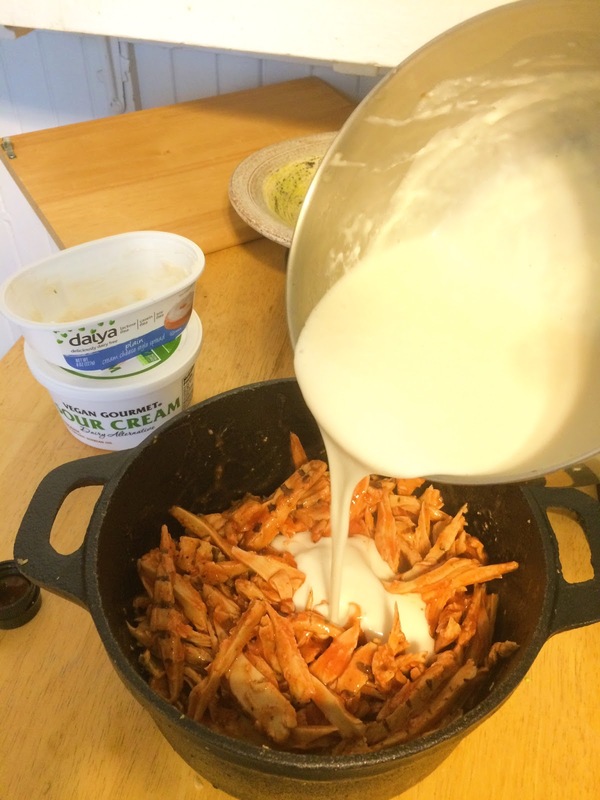 In a medium sized saucepot, combine the cream cheese and ranch dressing. Whisk while heating until smooth. You don’t want any cream cheese clumps! 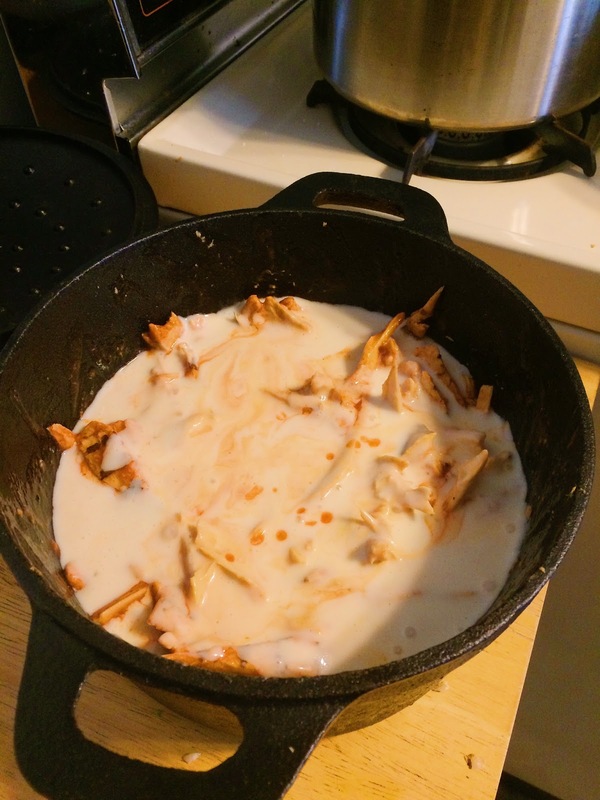 Pour the cream cheese mixture over the chicken and spread out. 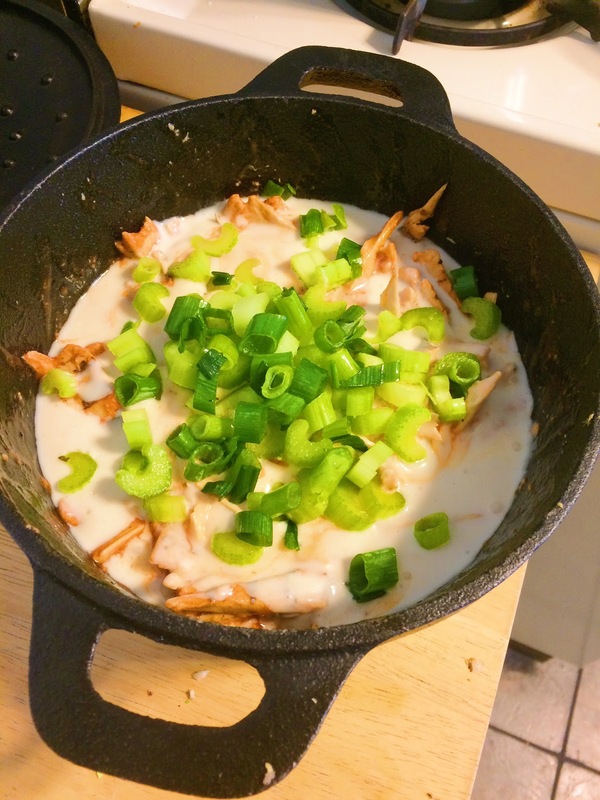 Sprinkle the celery and green onion on top. Grill with tight lid for fifteen minutes. 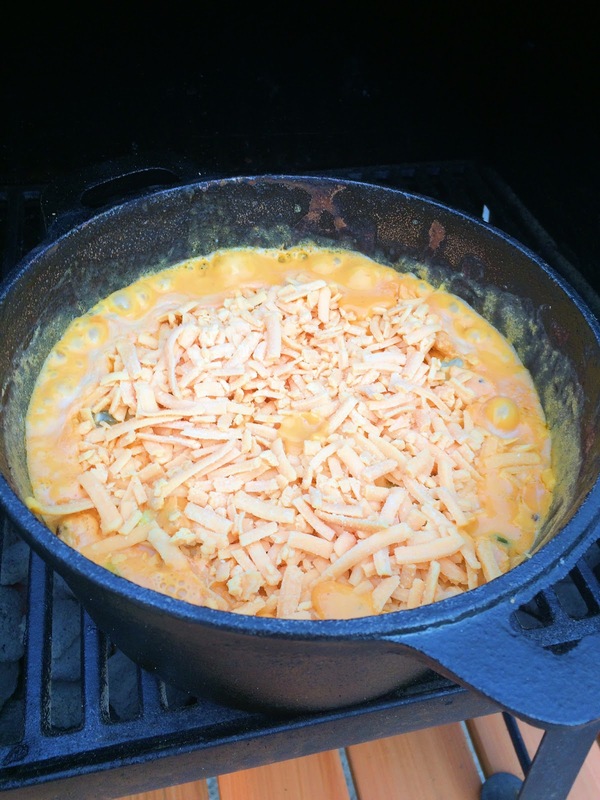 After fifteen minutes, sprinkle the cheddar cheese on top and continue baking for another ten to fifteen minutes, or until the cheese has melted and is bubbling. Remove from heat and let sit for ten minutes. Stir well and serve with grilled pita and celery sticks. 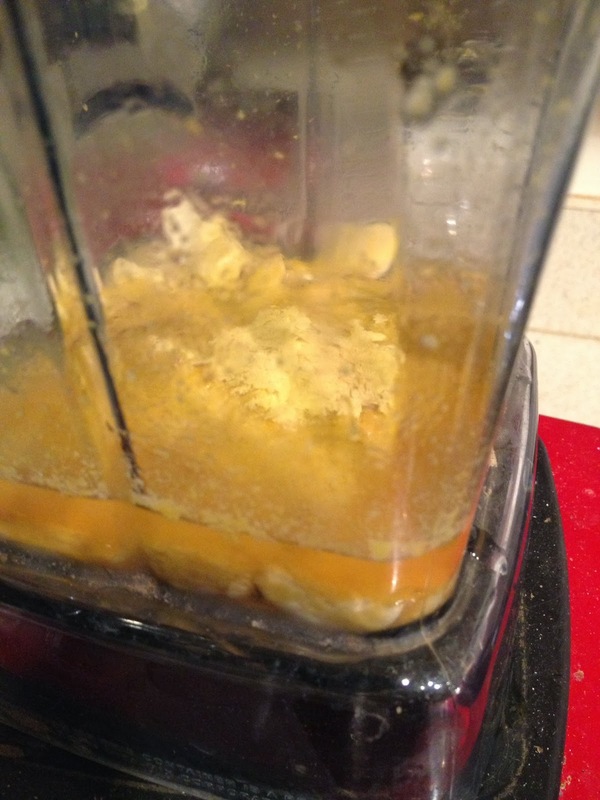 After 15 minutes, add the cheese. Look at the bubbles! Things have changed for the better in Cleveland. The Indians are in the playoffs and the Browns are tied in first place after a convincing win against their division rival. 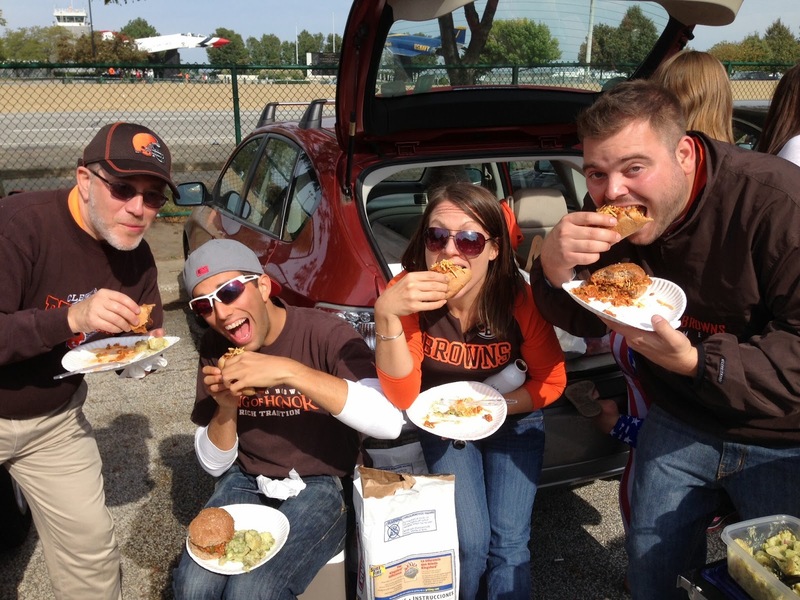 I’m pretty convinced the karma of the vegan tailgate had something to do with it. 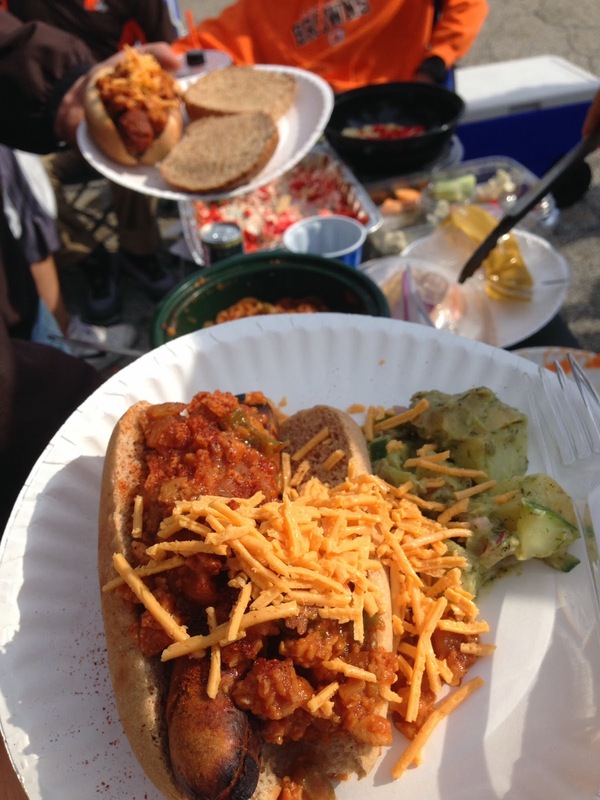 We had 5 people eating exclusively vegan at our tailgate this past Sunday, our biggest yet! 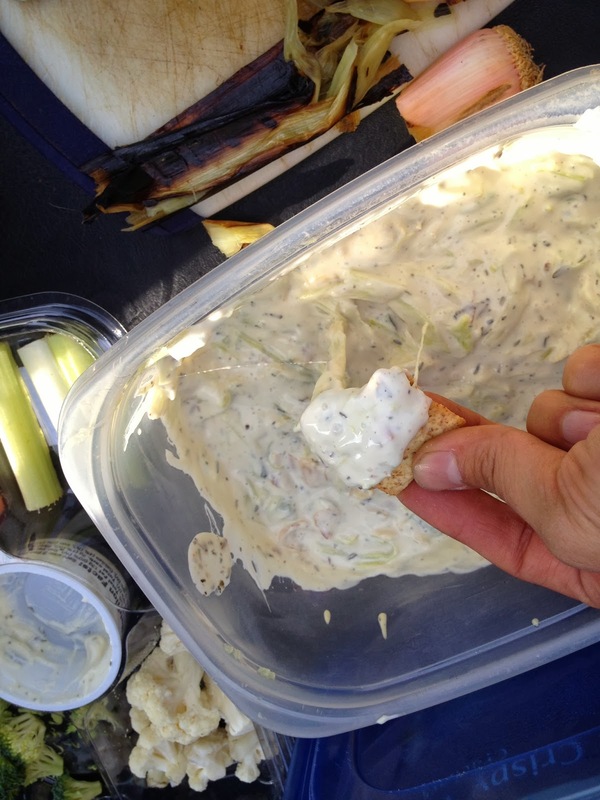 I got things started off with the phenomenal grilled leek dip that, because of time spent preparing ahead, required little work except grilling and slicing the leeks. 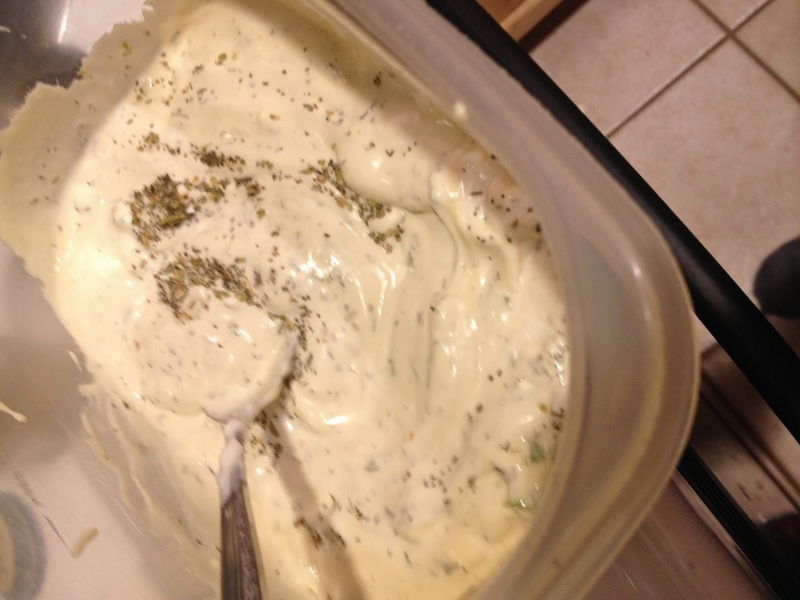 If you’re a reader on this blog, you know I love dips to warm up the belly prior to eating a big meal. This one really was a crowd pleaser and vegans and non-vegans alike really enjoyed it. It comes from Tamasin Noyes, a vegan chef and writer I met earlier this year at the Cleveland Veg Fest. Her cookbook, “Grills Gone Vegan” is one of my favorites. Only next time, I’ll have to triple the recipe! 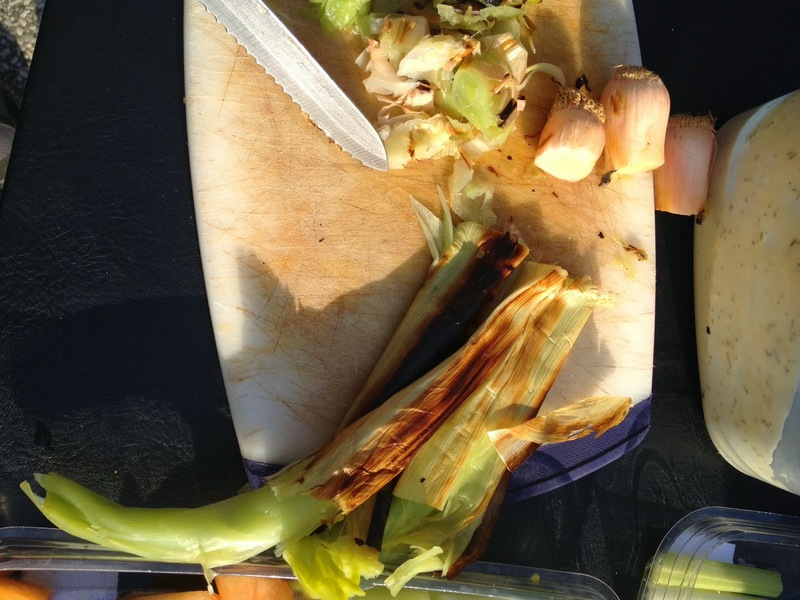 The grilled leeks are key for this recipe. They kinda come out nowhere and some people had never heard of them before. But they perform well. Kinda like a quarterback starting for the Browns right now! Enjoy! Grill the leeks, about 5 minutes on each side. 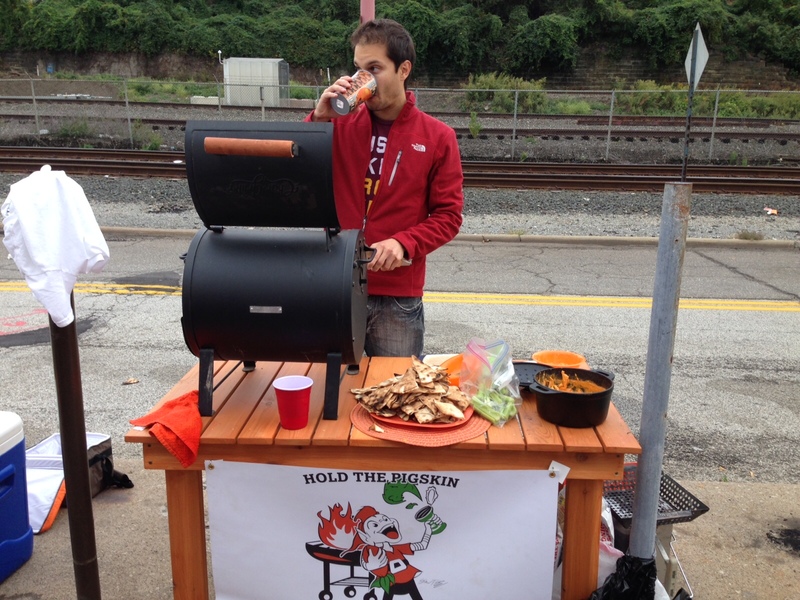 The rest of the tailgate was a lot of fun. Remember, anyone who wants to join can just comment on a post or hit me up on Twitter. Lets beat the record number of vegans for the Lions game on the 13th! 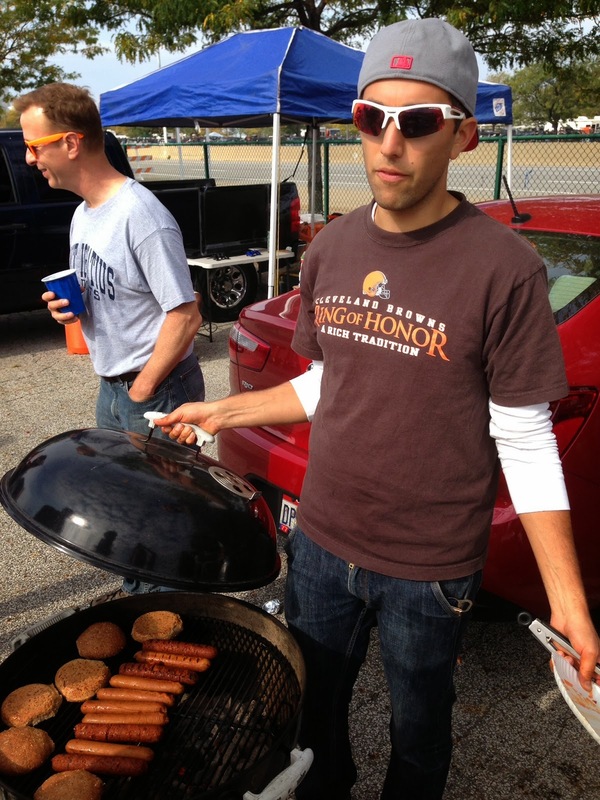 It’s officially the tailgate offseason. But have no fear! 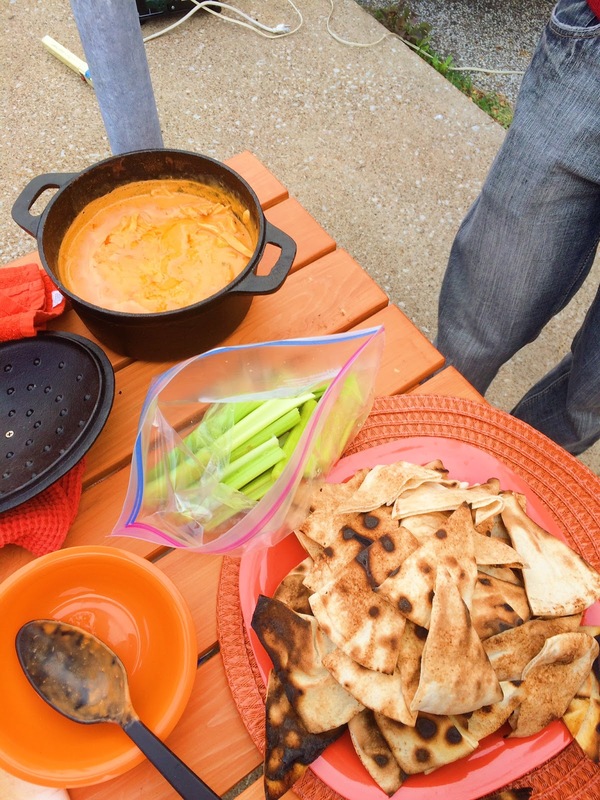 There are plenty of tailgate adventures that don’t require a parking lot and all of these recipes can be used at your favorite tailgate. My mom loves eggplant. Any excuse she has for me to make it is good enough for her. There is something about eggplant that just begs to be grilled or smoked. Its dark texture, fleshy inside, stubborn skin are best utilized when slow cooked over a long period of time. This recipe can be made entirely in a parking lot and is easy to do if you pre-chop all the herbs and spices. 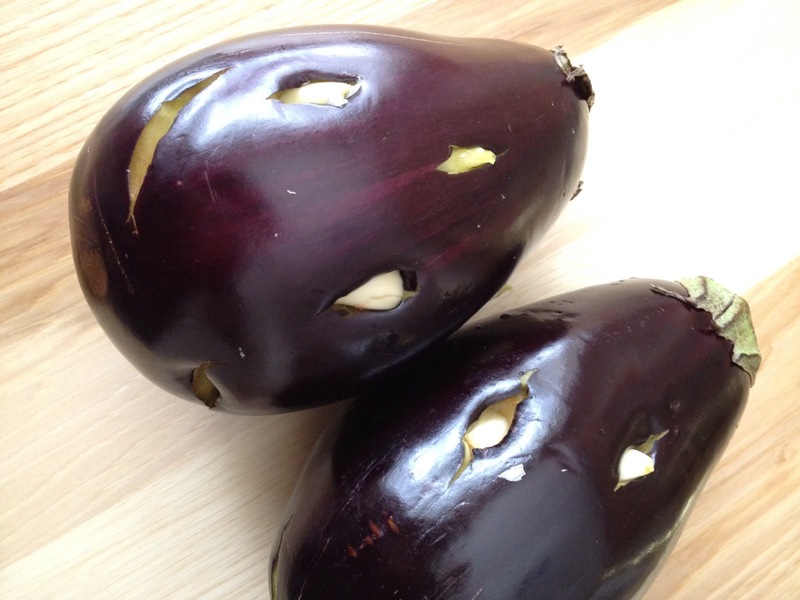 Smoking big eggplants takes some patience, especially when cooking the entire aubergine. I really enjoy studding the entire eggplant with garlic prior to cooking. 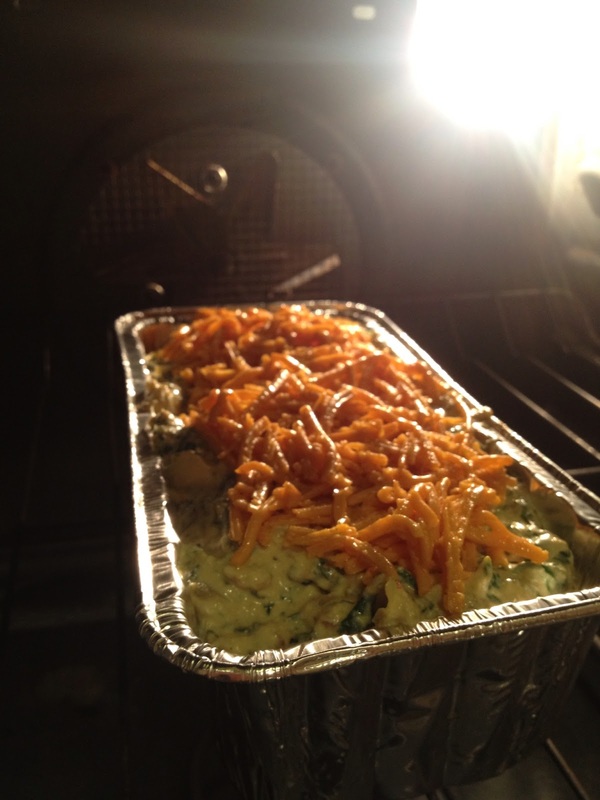 This way, the garlic imparts great flavor inside and cooks at the same time. Enjoy! 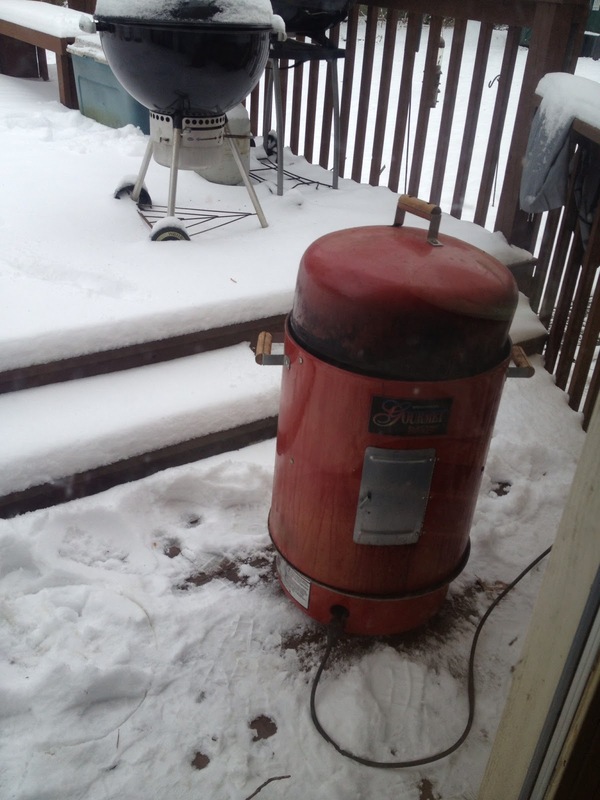 Prepare the smoker. Place the rack as close to the water as possible. Smoke the eggplants for at least 2 hours. Meanwhile, chop the herbs. 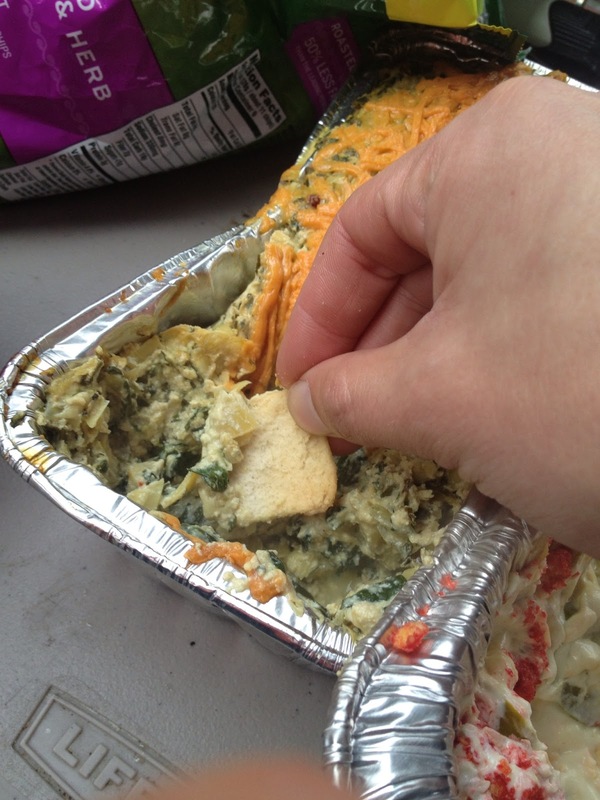 Place in bags or tupperware if bringing to the tailgate. 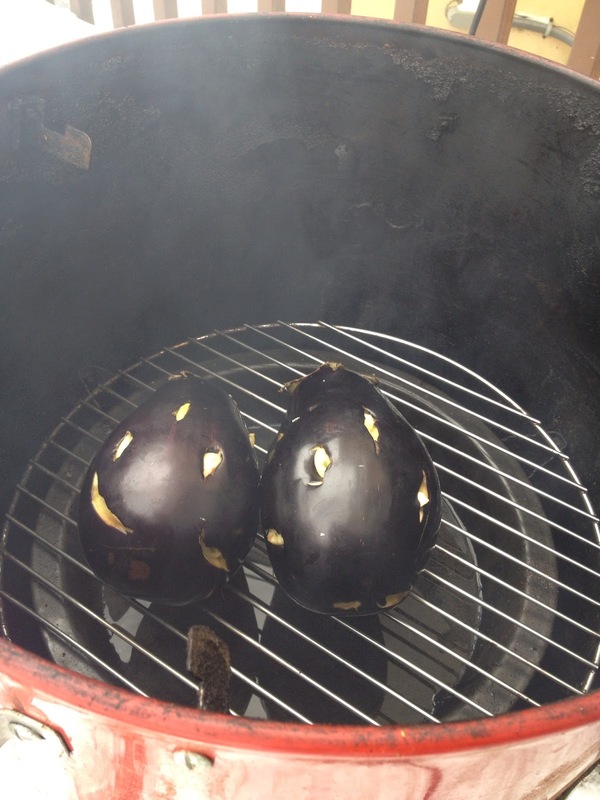 Once the eggplants are soft remove them from the smoker and let cool for 15 minutes. If its cold outside this takes less time! 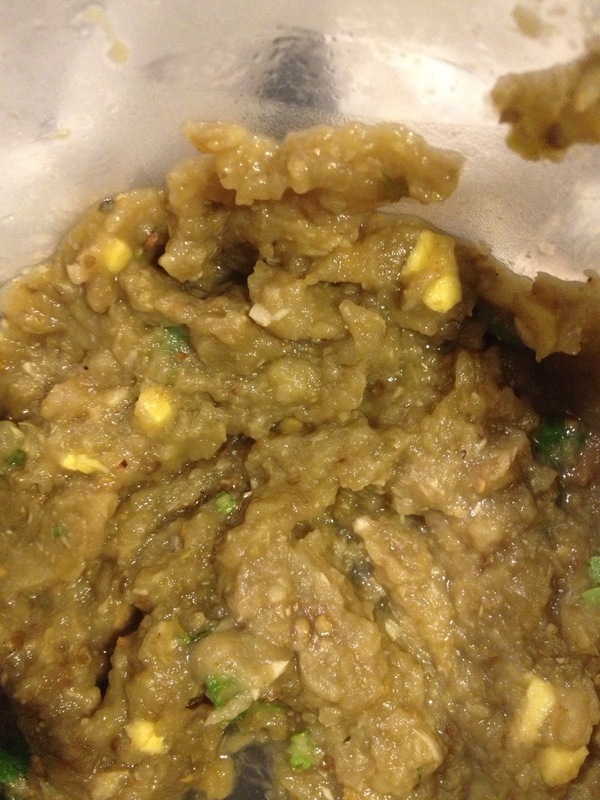 Peel the eggplant and mash (I actually used an imersion blender) along with the garlic. Peeling is easier with a paring or pocket knife. 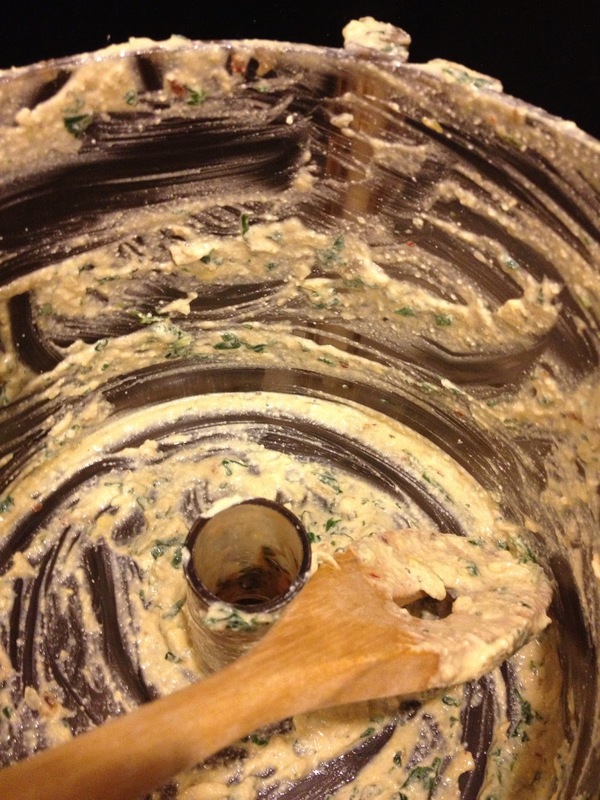 Add the herbs, spices, yogurt, and lemon juice to the mashed eggplant/garlic. Add salt and pepper to taste. 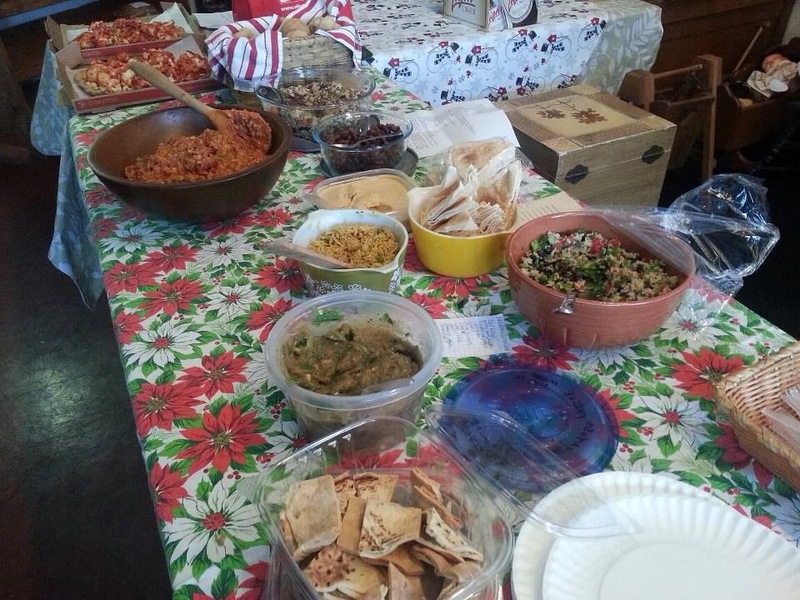 The eggplant at a vegan potluck!